The rumors were true: Borderlands is coming to new-gen consoles. Today 2K And Gearbox announced Borderlands: The Handsome Collection will arrive on Xbox One and PS4 in March. The bundle is named after the series villain Handsome Jack and includes the two games that center around him: Borderlands 2 and Borderlands: The Pre-Sequel. Gearbox is also throwing in all of those games' DLC packs*. The first Borderlands isn't part of the bundle. It's somewhat surprising that Gearbox would choose to include an interquel but not a numbered entry in the series. I can't disagree with the decision, though. I think that Borderlands 1 was actually the weakest of the bunch. You can argue that Pre-Sequel was unnecessary in terms of story but it had a lot more variety in terms of weapons, environments and enemies than the first game. Both games will have upgraded visuals on PS4 and Xbox One. Players who own those games on Xbox 360, PS3 or PS Vita will be able to transfer their save files, characters and Badass Rank to the new-gen versions. However, these transfers only work within the same console family (Xbox 360 to Xbox One, PS Vita and PS3 to PS4). Arguably the most exciting feature of the PS4 and Xbox One versions is split-screen. Up to four players will be able to play simultaneously on the same television. This is the first time that Borderlands games will have four-player split-screen outside of fan mods. Borderlands: The Handsome Collection will cost $60. Superfans can also opt for the Claptrap-in-a-Box Edition. 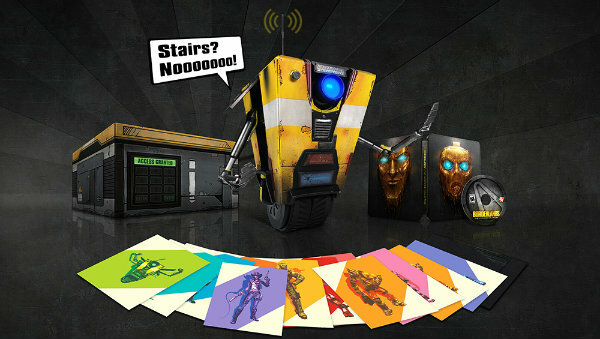 This $400 bundle comes with a remote controlled Claptrap robot, 12 lithographs and a collectible steel case. The robot can be controlled with a smartphone, say lines from the games, and stream video to the smartphone through its eye. Only 5,000 copies of the Claptrap-in-a-Box Edition will be sold worldwide. Gearbox boss Randy Pitchford said on Twitter that Batman: Arkham Origins Blackgate developer Armature Studios and Marvel vs. Capcom Origins developer Iron Galaxy Studios both helped out with the ports. Iron Galaxy previously assisted Gearbox in bringing Borderlands 2 to the Vita. Congrats @ArmatureStudio and @ItotheG for today’s announcement and for the help! We’re so busy, fans would not get this game without you! @D2FXPrime PC version rules! Nothing to be sad about :) This wasn’t going to be possible, but we got help after demand swelled. Borderlands: The Handsome Collection will hit Xbox One and PS4 on March 24th in North America and then spread to other countries on the 27th.